Florida Gov. Rick Scott is calling on FBI Director Christopher Wray to resign after discovering that the FBI failed to investigate a tip that the Florida school shooter could be plotting an attack. Left: Florida Gov. 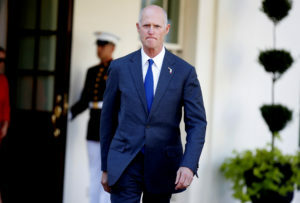 Rick Scott is calling on FBI Director Christopher Wray to resign after discovering that the FBI failed to investigate a tip that the Florida school shooter could be plotting an attack. Photo by REUTERS/Joshua Roberts.